The IMPULSE•G+ Mini is factory preset for Basic application programming. This allows the technician to easily navigate and program the drive via a built-in keypad display in minutes for most applications. The IMPULSE•G+ Mini provides the choice of programming in Basic or Advanced access levels. In the Basic access level, the parameter availability (features) and navigation is nearly identical to the IMPULSE•P3 Series 2 in Basic mode. In the Advanced access level, the parameter availability and feature set is opened up to reveal the full capacity of the IMPULSE•G+ Mini drive. In this mode, the up and down arrow keys will navigate through the already familiar parameters of the IMPULSE•G+ Series 3 Crane Control. This built-in feature continuously detects hoist overload conditions throughout the frequency range, halting upward motion and only allowing the load to be lowered. It continuously monitors the hook load, both during acceleration and constant speed, eliminating the need for load cells in most applications. Its new auto-setup feature will define the hoist’s maximum hook load in seconds. Load Check II detects overload conditions when loads are “snagged” during low speed operation. With these control advancements, the drive will pause lifting when the rated capacity is approached and will only allow the load to be lowered. These enhancements provide increased saftey and productivity. Our most compact low HP drive to date, the IMPULSE•G+ Mini’s size permits the use of smaller control enclosures, reducing the overall cost of an installation. It also expands application opportunities on smaller cranes, hoists, trolleys and monorail carriers. The IMPULSE•G+ Mini is available with standard 120VAC interface card, with 24VAC optional. Available in ½ through 20 HP in 380-480V or ¼ through 20HP in 200-240V 3 phase ratings. This allows the user to select the most cost-effective product for low HP applications through Class D service. Variable Frequency Drive (VFD) technology provides energy savings compared to traditional contactor technology. All of Magnetek’s motion control products are designed to efficiently utilize available power, thereby reducing energy costs for you and your customers. Designed with reliability and economy in mind. The hardware and software were designed and extensively tested specifically for the operating conditions seen in overhead material handling applications. The IMPULSE•G+ Mini is backed by our two-year warranty. This option reduces the depth of the drive by as much as 45%. Finless capacities are available in 230-460V ½ through 5HP. Consult factory on the suitability of the flat heat sink design for your application. 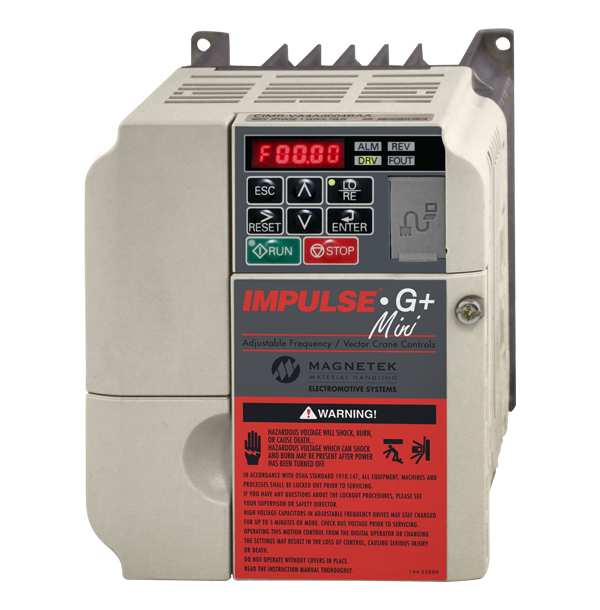 IMPULSE•G+ Mini can also be purchased as part of a complete pre-engineered complete control panel. The IMPULSE•G+ Mini provides the choice of programming in Basic or Advanced access levels. In the Basic Control mode level, the parameter availability (features) and navigation is nearly identical to the IMPULSE•P3 Series 2 in Basic mode.